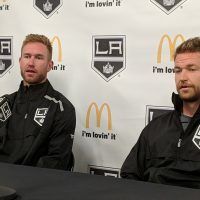 Back in July, Trevor Lewis stopped by MayorsManor and shared that he’s open to just about anything this season. Even though he primarily played center during his rookie season last year, he’ll happily move to the wing if that’s where coach Terry Murray wants him. For him, it’s all about wanting quality minutes. That’s comforting to head coach Terry Murray, who will be faced with some tough choices here in the next week or so. Along with GM Dean Lombardi, they have, what seems like, 87 players in camp right now competing for spots on the bottom two lines. One of the names that brings the most uncertainty is Andrei Loktionov. One possible advantage that Lewis may have at the moment, is Murray say him all year last season and in the playoffs. Until he actually does it, on a consistent basis, questions will probably continue to be asking about Loktionov’s abilities at the NHL level – regardless of how impressive he’s been during his development up to this point. How far up the ladder he moves this season is still to be determined. 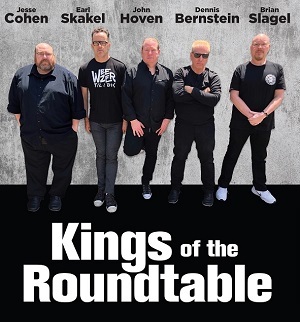 “Center. That’s what I’m thinking about. I’ve always played center and my first time playing on the wing was here (last season). I want to play center,” the Russian forward said. 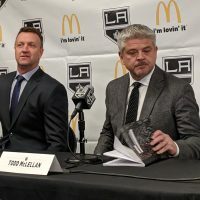 Now, his focus has shifted to finding a way to make the LA Kings this season. Lewis was the 17th pick in the first round of the 2006 NHL Draft. During his rookie year in the NHL he posted 13 points (3 goals, 10 assists) in 73 games. 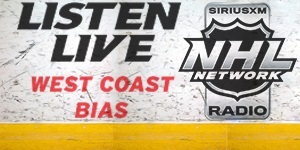 During the playoffs, he had four points in six games vs. the San Jose Sharks – including his first post-season goal. 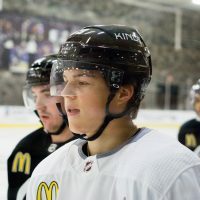 Loktionov is currently ranked fifth on the MayorsManor listing of the Kings’ top ten prospects. 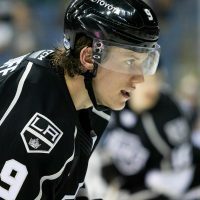 The 21-year-old forward is coming off injury shortened season, due to a shoulder injury that limited him to 19 games for the Kings and 34 games in the AHL. He was a fifth round pick in 2008.